Is the boring schedule of daily life has taken away the zest to live and enjoy the day fullest? If yes then, leave all the worries behind and get ready to accumulate those things which adds colors to your life like appealing accommodation, updated neighborhood, smooth connectivity to give you access to other important destinations, etc. See, mere work by day in and out cannot fetch you the satisfaction which one needs to have for a meaningful today and tomorrow. It is true that today’s chaotic lifestyle has taken away the energy to pay attention towards our family, sweet home, friends and relatives. But this is not a true way to live other things are equally important lead a stress free life. Calm down, you don’t need to lose yourselves in deep thought about how you can make your life worth living as Puri Developer is ready to take you in a world where you can experience paradise on Earth. Puri Diplomatic Greens phase-2 is an address of dream like luxury abode, which consists of 10 high-end sophisticated 5 bedrooms villas and 3/4 BHK apartments. It is strategically placed on Dwarka Expressway in Sector-110A, Gurgaon. Here you can pick a villa or apartment according to your need; both are thoughtfully and stylistically constructed to match the personality of its unique inhabitants. Those who will book their space here will never have to take burden about factors like connectivity, safety, power back up, home decor, etc. It is just 10 minutes away from IGI Airport and all other contemporary places are also at a close distance like renowned schools, colleges, restaurants, market, cafeteria and children’s park. Day spend here will definitely bring you an enthusiasm and standard to keep you in a pace with rapidly changing world. See home is the place where you come after spending a hectic day out just in a search of that peace and happiness which is tough to get at your work place and any other destinations. Here you can easily checkout activities like table tennis, billiards, swimming, gymnasium, coffee bar, etc. Normally we avoid indulging in these lively movements because we don’t need to step out of our safe zone. Therefore, Puri Developer has arranged these amenities and services within the diameter of your residence. These villas and apartments are properly ventilated and opened from three sides. It covers the large land of over 82 acres where the developer has tried to accumulate all those modern amenities which is important to make an address posh. The right time has come to invest the money in the right place and that impeccable and ideal place is “Puri Emerald Bay” and this residential property is designed and conceptualized in the excellent and nattily way so that buyers not only enjoy this beautiful place, but also discover the wonderful life with the family all the way through, interestingly, this smart project not only fulfills todays desires, but also future so that it cut the mustard each time. Also Gurgaon is one of the happening places where zillion of builders and investors are showing their interest and that is very clearly because of its smooth connectivity that further connects each one to Delhi, Sohna, Faridabad and even to Social infrastructure that includes school, hospital, educational institutes, shopping complex, bank facilities etc. all within the distance. Coming back to the Puri Emerald Bay project, here buyers can pick 2, 3BHK apartments and each of them maintain complete freedom, peace and comfort all the time so that it entice everyone in all sense. Today the meaning of home is much wider and bigger and it includes space, privacy, modern amenities, comfortable, excellent location, breathtaking infrastructure, etc. and keeping everything together plenty builders are putting up an excellent projects in Gurgaon which exemplify everything so beautifully and elegantly. Above all, Puri Developer is one of the leading builders and they are specifically known for their customer’s satisfaction and they try to sum up everything in each project and that is because what they offer gives a long lasting impression on each one and also accelerate in terms of investment. So one should invest their money in property because it is going up year after year, so the one who is looking for an effectual platform, then Puri Emerald Bay will unquestionably be the one where residents will get the feeling “ This is it”. So hurry!!! And get the myriad benefit out of it because today’s investment is directly linked to your future investment and the more you invest today more your future will become powerful and potent. 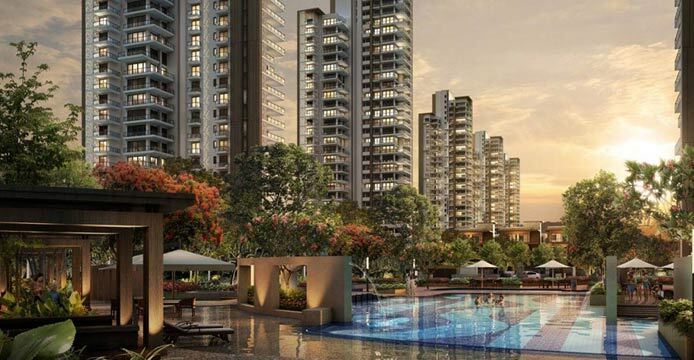 Also, it is located in sector 104, Gurgaon, which is one of the demanding sectors because of its easy and comfortable reach to numerous other place and especially those which are important in day to day life.